Explosions at the iconic Boston Marathon Event in the US have sent shock waves causing the Western media to focus intensively on the global phenomenon described as terrorism. In Sri Lanka there was a feeling of Déjà vu as the Island nation had also experienced bomb blasts at a Marathon event five years ago. 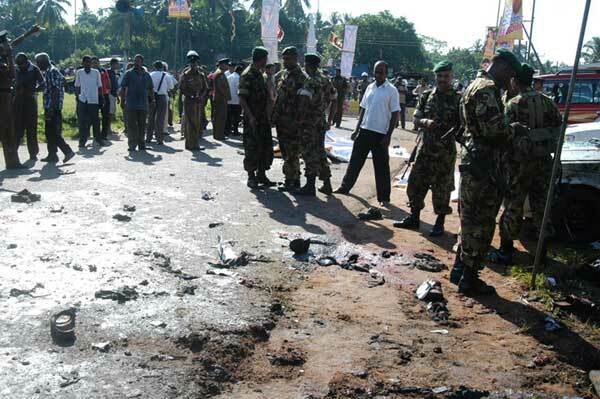 It was on April 6, 2008 that a suicide bomber of the LTTE targeted a marathon race event at Weliweriya in the Gampaha district killing 15 people and injuring more than 90 others. The Boston blasts resulted in three deaths and 132 injured. It was this overt similarity of a marathon race event being targeted in the US that evoked sentiments of a common experience in Sri Lanka. There are however some differences between both explosions. In Sri Lanka it was a lone suicide bomber who exploded himself whereas in the US two brothers were involved in placing and triggering off the bombs. In the US the explosions occurred at the conclusion of the race while in Sri Lanka it happened just before the marathon started. Also while the number of deaths in Sri Lanka was more the number injured was less than that of the US. Crucially the important difference between the two tragic events was in the nature and objectives of the perpetrators. In Sri Lanka the attack was identified as the handiwork of the then powerful LTTE whereas in the US there is little evidence so far to indicate whether those responsible are part of an organisational or not. In Boston there were no specific human targets singled out deliberately. The event by itself was the target with the victims being people in general. The terror unleashed was random in nature. In Weliweriya the Marathon race was not the direct target but only an avenue to eliminate a particular individual. The aim of the Tigers was to assassinate the then minister Jeyaraj Fernandopulle and the marathon provided an opportunity. All the other victims were from a Tiger perspective “collateral damage”. Jeyaraj Fernandopulle was a minister in President Mahinda Rajapaksa’s Government and held the portfolios of Trade, Commerce, Consumer Affairs & Marketing Development and Highways. The senior Gampaha district MP was also the Chief Government Whip. Sudarshini Fernandopulle’s reaction and response to the Boston marathon bombings is quite understandable. It is but natural that the incident revived memories of her departed husband. Her entry into active politics after his death was due to her determination to continue with the political vision and mission of her spouse. Five years have passed since Jeyaraj’s death and this Column drawing from earlier writings intends to focus on this remarkable politician hailing from Manalsenai or Welihena. Jeyaraj was a unique personality belonging to a miniscule ethnic community in Sri Lanka known as the Colombo Chetties. Yet he managed to win five consecutive elections from a district overwhelmingly populated by people of other communities. Canisius Jeyaraj Fernandopulle was born on January 11, 1953 at Welihena/Manalsenai in Kochchikade close to Negombo. He was the son of BF and Alice Mary Fernandopulle. Jeyaraj was the third of eight children (Scholastica, Nihal, Jeyaraj, Sisinia, Felician, Jude, Priyantha and Priyadarshini). His father was an official in the Prisons dept. Jeyaraj had his primary education at Ave Maria Convent and secondary education at Maris Stella College in Negombo. He displayed leadership qualities in school and was head prefect. In 1972 Jeyaraj became a science and maths teacher at the Welihena Govt. School. He entered Law College in 1974 and passed out as an attorney-at-law in 1977. He won the silver medal in the Address to the Jury in Sinhala, at Law College. He was appointed as the secretary of the SLFP branch of the Law College in 1975. Jeyaraj apprenticed under the famous Negombo Advocate Camillus Rodrigo. He began practising on his own in the Magistrate’s Court of Negombo and the High Court of Negombo in December 1977. Jeyaraj built up a lucrative practice in Negombo. He appeared in hundreds of criminal cases in courts. In labour tribunals he appeared for many litigants who had lost their jobs. He has also appeared without charging fees in about 12,000 cases for those who couldn’t afford to hire lawyers. He cut his political teeth as a 17-year-old in 1970 by being counting agent for a candidate contesting the Katana village council. Jeyaraj then worked for the SLFP in the 1974 Katana by- election and in the 1977 general election. It was actor-politico Vijaya Kumaranatunga who contested Katana against Wijepala Mendis in 1977. Jeyaraj was closely associated with Vijaya and later Chandrika Kumaratunga at one time. When they formed the Sri Lanka Mahajana Pakshaya in 1984 Jeyaraj opted to remain with the SLFP and was close to Sirima and Anura Bandaranaike. He was made Katana SLFP organizer in 1984. He first won from the Gampaha district in the polls of 1989. Thereafter he was re-elected in 1994, 2000, 2001 and 2004. In 1994 he was first appointed as the Deputy Minister of Finance, Ethnic Affairs & National Integration and was later appointed as Deputy Minister of Plan Implementation, National Integration and Ethnic Affairs. In 1997 he was appointed as the Minister of Plan Implementation and Parliamentary Affairs. In 2000 he was re-elected and appointed as the Minister of Civil Aviation, Tourism and Christian Religion Affairs. In 2004 he was re-elected as a Member of the Parliament and was appointed as the Minister of trade, commerce, consumer Affairs and chief government whip of parliament. In 2005, after the Presidential election he was appointed as the Minister of Trade, Commerce, Consumer Affairs and Marketing Development and minister of Highways. In 1995 Jeyaraj Fernandopulle formed the Educational Development Foundation that has performed yeoman service in that sphere in Katana, Negombo and Ja-ela. Among services provided were scholarships for more than 3,000 underprivileged O/L students, some125 scholarships to undergraduates, supplying equipment free-of-charge to schools etc. Jeyaraj married to Sudharshini a medical doctor specialising in family health. The Fernandopulles had two children. The girl Samurdhi was a student at St. Bridgette’s and son Bhanuka was a student at Colombo International School at the time Jeyaraj died. Both Jeyaraj and Sudharshini are from Welihena or Manalsenai as it is known in Tamil. Kochchikade, Manalsenai, Thoppu and Waikkal are places where a substantial number of Colombo Chetty and Bharatha community people have been living. It is said that there has been some intermingling between the Colombo Chetties and Munnakkarai Bharathas of Negombo. These communities are an integral part of Western coast Tamils living in Gampaha and Puttalam districts. An analysis of Tamil social formations in Sri Lanka reveal that they are of four broad categories, Northern, Eastern, Up-Country and Negombo – Puttalam Tamils. Many of the Catholic Tamils in the Puttalam-Negombo region underwent “ethnic transformation” after the medium of instruction was changed from Tamil to Sinhala in about 60 to70 schools run by the Catholic church. While the older generation speaks Tamil the new generation is more at home in Sinhala. Many old timers have Tamil dressing styles and cooking habits still. An indicator of this change is manifested in Manalsenai itself. The place was known as Manalsenai at the time of independence but nowadays it is called Welihena the Sinhala equivalent. The Colombo Chetty community to which Jeyaraj Fernandopulle belongs possesses an interesting history. The Chetty or setti (sethi in North india) community of South India is classified as Vaishya according to Manu dharma tenets. The Vaishyas are of three categories. Dhana vaishya, Poo vaishya and Ko vaishya. The Dhana viashyas have traditionally engaged in commerce and trade. Originally from South India, it is said that there has been a widespread Chetty presence in Sri Lanka from time immemorial. Gradually the Chetty community got absorbed into the Sinhala and Tamil communities. In Sinhala they became known as Hetti. Place names like Hettiawatte, Hettigoda, Hettipola, Hettimulla etc., in Sinhala and Chettipaalayam, Chettykulam etc., in Tamil demonstrate the Chetty influence. During the time of the Kotte Kingdom and the arrival of the Portuguese a substantial Chetty community thrived in Colombo and environs. Most of them embraced the Catholic faith and became a distinct entity known as Colombo Chetties. Likewise there is a community in Malaysia known as Malacca Chetty. The bulk of the Chetty community spoke Tamil though there were Vaishya members from the Telugu, Malayalam and Kannada regions also. It must be remembered that Tamil was the “lingua franca” of commerce in South and South – East Asia in those times. Whatever their origins in South India the Colombo Chetty Community of Sri Lanka evolved as a distinct entity different from the Chettiyar community of Tamil Nadu known as Naatukkottai Chetty or Nagarathaar. There are many members of this Community in Sri Lanka too engaged mainly in trade and commerce. They retain a strong Tamil Hindu identity unlike the Colombo Chetties who are mainly Christian. The national census of 1814 shows the total population as 492,083 of which Colombo Chetties were 2459; In 1824 the total population was 851,940 of which Chetties were 8471:In the population census of 1871 total population was 2,401,066 of which the Chetties were down to 3114.Thereafter the Chetties were classified as Tamils in the official census but retained their Colombo Chetty identity socially and culturally. Some of the greatest Tamil scholars like Simon Casie Chitty were from this community. Colombo Chetties like Casie Chitty and Brito have represented the Tamils in the administrative sphere during the British colonial period. Gradually under British rule English became widely spoken among Colombo Chetties. There was also much inter-marrying with other ethnic groups particularly Burghers. Some were absorbed into other ethnic groups. Colombo Chetties live mainly in the Southern,Western and North – Western provinces though many of them don’t acknowledge their specific ethnic identity. The 1983 July anti-Tamil pogrom saw many Colombo Chetties being attacked. Some panic-stricken leaders of the community prevailed upon President JR Jayewardene (who himself has chetty ancestry) to categorise them as a separate community. They were recognized as a distinct ethnic group ratified by the Registrar General’s Department the notice of which was published in the Observer newspaper of October 17, 1984. In the “incomplete” 2001 census, the Colombo Chetties were classified independently and not as Tamil. Their number was estimated at 10,800 in 2001. The 2011-12 Census places the Colombo Chetty population at 6075. Reasons for this decline in numbers are manifold. Children are fewer as is usual in families enjoying a higher educational and economic status. Many have migrated particularly after 1983. Several have married outside the community and got absorbed into other ethnicities. Above all there is a marked tendency among many members of the community to play down their unique identity and pose off as belonging to other ethnicities. The Chetties have contributed substantially in the intellectual realm. De Melho translated both biblical testaments into Tamil. John J. Casie Chetty translated Voet’s Roman Dutch Law into English. Many Chetties have claimed several ‘firsts’ for the former “Ceylon”.. Among them are Simon Casie Chitty the First Civil Servant and Publisher of the first gazetteer, Dr. Peter Philip Jurgen Quint Ondaatje was the first Asian to figure in modern European history: Rev. Philip de Melho was the first Ceylonese to be admitted to the Christian ministry; Henry Francis Muttukrishna was the first Tamil Barrister in Asia. Dr. William Charles Ondaatje was the first Ceylonese director of the Botanical Gardens he introduced the olive to Sri Lanka, Dr Simon de Melho Aserappa was the first Ceylonese who obtained the degree of Doctor of Medicine from a British University; John J Casie Chetty was the first Bachelor of Civil Laws (Oxford) in Asia, Arthur L. R. Aserappa was the first Ceylonese who won prizes at the Cambridge Junior Exhibition. Jeyaraj Fernandopulle was the first member of the Colombo Chetty community in post-Independence Sri Lanka to be elected to Parliament and made a Cabinet Minister. This was an outstanding achievement because he did not depend on his own ethnic group for votes. Now his wife too has followed in his footsteps and was elected as the first woman MP from the Colombo Chetty community in Independent Sri Lanka. Jeyaraj Fernandopulle depended on votes from outside his community for electoral success. As such it was in his interest to pander to that external constituency alone. There was no need and indeed it may have been politically counter – productive to emphasise his own ethnic identity. The remarkable aspect of the man was that he did not do so. He always asserted his minority identity as a Tamil-speaking, Roman Catholic and a Colombo Chetty. He spoke Sinhala, Tamil and English and was able to deliver excellent speeches in all three languages. Whenever he addressed Tamil gatherings Jeyaraj always spoke in Tamil. He would often speak in Tamil to fellow Tamil and Muslim MP’s within Parliamentary portals. In mixed company Jeyaraj would talk in Tamil to Tamil – speakers and in Sinhala to Sinhala – speakers. He has also been immensely helpful to many Tamils living in both the Gampaha and Colombo districts. Jeyaraj has done more for Tamils, both of Sri Lankan and Indian origin than many Tamil MPs who use their ethnicity to enter Parliament. He has always admitted that the Tamils in Sri Lanka faced many problems and required a comprehensive political solution. He has openly stated so inside and outside Parliament. Jeyaraj however was firmly against separation and the LTTE. The solution he envisaged was within a united Sri Lanka. There was a time when Jeyaraj visited Jaffna as an opposition MP and engaged in discussions with the LTTE. He wanted to help reach a solution providing justice to the Tamils in a united Lanka. Even at the Geneva talks Fernandopulle was a Government delegate. He tried very hard to reach some understanding with the LTTE. He was rebuffed. It was with a great sense of sadness – shared with some of his friends – that Jeyaraj reached the conclusion of total war with the LTTE being unavoidable. There could be no solution within a united Sri Lanka as long as the LTTE remained a powerful player he felt. It was therefore with clarity of conviction that he criticised the LTTE boldly and supported the Government’s war against the Tigers. Jeyaraj re-iterated privately and publicly that a political solution was necessary for the Tamils and that he would strive for one after the LTTE was decisively weakened or defeated. Though a part of the Rajapaksa regime Jeyaraj has also maintained his independence. Jeyaraj was at one time close to the Bandaranaikes but later threw in his lot with Mahinda Rajapaksa after the party appointed Mahinda as presidential candidate. Yet he has also been critical openly of the shabby treatment meted out to the Bandaranaikes. Jeyaraj along with Nimal Siripala de Silva and Maithripala Sirisena formed the senior ministerial triumvirate around Rajapaksa during his first term of office. In recent times he became the Government’s staunch defender and unofficial spokesperson. He was devastatingly critical of opponents in Parliament and would also answer on behalf of the Government as Chief Whip. He would very often articulate the Government viewpoint. He engaged in harsh banter with opposition MP’s but always maintained friendly relations with them. He would go to unexpected lengths in his zeal to defend the Government. Once he called UN officials as being in the pay of the LTTE. Gradually Jeyaraj became very close to the Rajapaksa dynasty and defended its interests stoutly. This columnist once referred to him as the “Rajapaksa Rotweiler”. He was not offended and indeed seemed amused quipping that the canine was indeed a fierce animal. On a personal note, Dale Carnegie of “How to win Friends and Influence People” fame once observed that a man’s name is the sweetest sound in any language to him. Jeyaraj Fernandopulle and I had in common the sweetest sound of any language. He and I were namesakes though totally unrelated. Being namesakes I was always attracted to any news report pertaining to him in the newspapers as the headings would inevitably have the word Jeyaraj in it. As Journalists we only break not make news. Hence I saw my name in the newspapers only as a byline but his name was there in the headlines. Since he was a frank and forthright person who did not hesitate to make controversial pronouncements on many a topic, he and by extension the name Jeyaraj was regularly in the news. As a result I began following most developments concerning him almost as a matter of routine. I must confess that I had become an admirer of the man particularly because of his political success despite his personal background. In Sri Lanka’s deeply divided society it is very seldom that a man of his calibre emerges among politicians. Jeyaraj Fernandopulle was the model Sri Lankan politician of the future with tri-lingual fluency. His loss has been to some extent irreplaceable and is felt greatly to this day. Nowadays I miss seeing the name Jeyaraj in news headlines.